Maurice Renard (1875-1939) was another early 20th century pioneer of science fiction, or to use his own term for it, scientific marvel fiction. 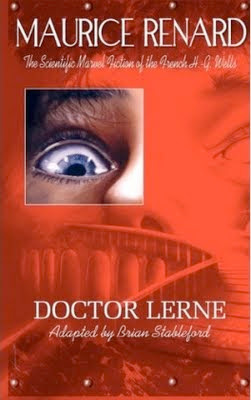 The Black Coat Press volume Doctor Lerne includes the novel of that name, a novella called Monsieur Depont’s Vacation and an essay of Renard’s on the subject of this genre of fiction. Like most French writers of such fiction at that time Renard found that the reading public had a limited taste for such works although he did later achieve considerable fame with a mystery novel tinged with science fiction, The Hands of Orlac. 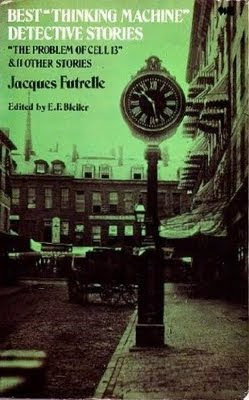 Monsieur Depont’s Vacation, published in 1905, was Renard’s first attempt at this newly emerging genre. There was a considerable vogue for dinosaurs at the time and this is one of the more interesting early attempts at a tale of dinosaurs loose in the modern world. It’s rather tongue-in-cheek in style and the highlight is the absurd but ingenious reasoning by which the scientist in the story convinces himself that it really is possible that an iguanadon and a megalosaur are wandering about the French countryside. 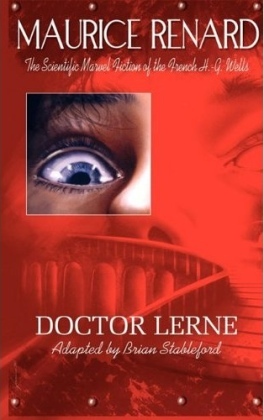 Doctor Lerne, published in 1908, is a much more ambitious and much more accomplished work. This is a classic mad scientist story. A young man, Nicolas Vermont, sets off to visit his uncle at his chateau. The uncle, Dr Lerne, has been conducting experiments in grafting and tissue transplant. It appears that he has made some colossal breakthroughs but there are several things that his nephew finds extremely disturbing. His uncle seems strangely changed and fails to recognise his nephew. His handwriting has altered, and he seems to have picked up a slight German accent. Nicolas’s assumption is that this is a result of Dr Lerne’s long and close collaboration with his three German assistants. Nicolas however cannot shrug off all his misgivings. When he finally gains access to his uncle’s laboratory he is horrified by what he finds. Dr Lerne has not only been transplanting organs from one species to another, he has even performed transplants from plant life to animal life. And this is only the beginning. Dr Lerne believes it may even be possible to break down the barrier between men and machines. Nicolas is the proud owner of a powerful and very advanced motor car, a machine so sophisticated that the scientist believes that machine life is a distinct possibility. It’s an entertaining mixture of horror and science fiction packed with original and ambitious ideas. Certainly one of the neglected early masterpieces of science fiction. Brian Stableford once again provides not only the translation but also an informative introduction and afterword. 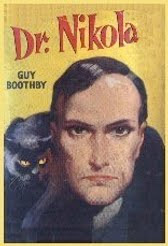 Dr Nikola (also known as Dr Nikola Returns) was a kind of sequel to Guy Boothby’s very successful 1895 novel A Bid for Fortune, which had introduced the world to the diabolical criminal mastermind Dr Nikola. Boothby would go on to write three further Dr Nikola novels, forming just a small part of the prodigious output of novels produced by this Australian writer during his brief but highly successful literary career (he died in 1905 at the age of 37). In the first novel Dr Nikola is trying to gain possession of a Chinese carved stick possessing vague but apparently almost limitless occult powers. His ruthless attempts to gain possession of this treasure involve a campaign of terror against a prominent Sydney citizen, a kidnapping and a bold bid to pass off a bogus English aristocrat. Chinese secret societies. Success will involve passing himself off as a Chinese high priest and gaining access to a remote Tibetan monastery. Failure will mean instant death. Dr Nikola requires an assistant for this adventure, and recruits an impecunious Englishman in Shanghai. Wilfred Bruce may be penniless and jobless but he does speak fluent Chinese and he does have a taste for adventure. Where this book differs, in a most interesting manner, from its predecessor is that although the story is narrated by Bruce we get to see things much more from Dr Nikola’s perspective, and he appears in a rather different light. Ruthless and unscrupulous certainly, with boundless ambitions, but also courageous and almost admirable. And perhaps not entirely evil after all. A megalomaniac, but possibly with the intention of being a benevolent megalomaniac. As in the first book we’re left in considerable doubt about the occult powers of both Dr Nikola himself and of the mysterious Chinese secret society. Does Nikola truly possess powers beyond those possessed by ordinary men? Are these powers supernatural, or merely paranormal? Or is he simply a skilled conjuror and hypnotist with a profound knowledge of psychology and quite probably considerable learning in the field of medicine, particularly in relation to the effects of drugs. Boothby leaves the question open, and while that can be a risky strategy the end result in this case is to heighten the fascination of the character. Dr Nikola was one of the earliest diabolical criminal masterminds in genre fiction and remains one of the most interesting examples of the breed. The first two novels in the series are published in a single volume in the Wordsworth Editions volume Dr Nikola Master Criminal. They’re a very entertaining blend of adventure and crime with a dash of the gothic and a large helping of the exotic. Highly recommended. They had a definite Boys’ Own feel to them, but the idea of a man who appears on the surface to be a harmless buffoon being in reality a brilliant crime-fighter and the scourge of various international conspiracies, and the further idea that he pursued these objectives in an unofficial capacity without the approval of the police - these ideas were to have an enormous influence on pulp fiction, comic-book, movie and TV heroes. It’s an influence that continues to this day. Drummond was interesting in that, as formidable as he was, he relied as much on brute strength and sheer bravado as on brainpower. He was rarely as clever as the diabolical criminal masterminds and international spymasters he came up against, but his courage, his tenacity and his sheer stubbornness were enough to carry the day. The first novel, in 1920, had seen Captain Hugh Drummond going slowly mad with boredom in peacetime England and looking for any kind of adventure. He got more than he bargained for, coming up against the nefarious Carl Petersen, a master of disguise, and the beautiful but deadly Irma. Irma claims to be his daughter. This may or may not be true. That she is Carl Petersen’s lover is more or less beyond doubt. Petersen is involved in a vast Bolshevik conspiracy although his own motives have more to do with power than political principles. Drummond had foiled these dangerous plans, but Bolshevik agitators are still busily at work. As the second novel opens Drummond has formed his old British army pals into an unofficial vigilante force to combat communist subversion. The conspiracy he uncovers seems so ingenious that he could almost believe that Carl Petersen himself is behind it. But surely that can’t be true? Can it? Surely the world has heard the last of Petersen and his depraved daughter? And yet it has all his trademarks! The stage is set for another showdown. The introduction to Wordsworth’s paperback omnibus collection of the four Bulldog Drummond novels dealing with the fiendish Carl Petersen makes grovelling apologies for the political incorrectness of these stories. Personally I think this is unnecessary and insulting. I’d prefer to be credited with sufficient intelligence to make my own judgements as to how I feel about McNeile’s politics. 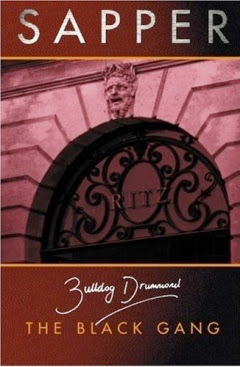 Be that as it may, the Bulldog Drummond novels are still highly entertaining. Doc Savage: The Man of Bronze was the first of 181 novels published between 1933 and 1949 featuring the scientist/adventurer/crimefighter Doc Savage. Most were written by Lester Dent although only one was published under his own name. This is the first Doc Savage novel I’ve read so my impressions of the character are necessarily based entirely on this one book. Doc Savage is almost a typical superhero, but not quite. His strength, energy and intelligence seem superhuman but the novel stresses that these extraordinary gifts are the result of intensive training both physical and intellectual. He is unusual among superheroes in that he relies on brains and brawn in equal quantities. He can smash in a steel door with his bare fists, but he can also quickly whip up a formula for an immobilising gas or find an antidote to a poison. The book quite neatly sets up situations where Doc is just as likely to need to call on his knowledge of medicine as on his ability to perform feats of strength and agility. Doc’s faithful assistants represent the same mix of street-fighting skills and technological and intellectual sophistication. They’re two-fisted action heroes who also happen to be chemists, electrical wizards or archaeologists. It’s a rather optimistic vision which I find to be quite refreshing. This is a world in which science and technology are still seen (quite correctly) in entirely positive terms. 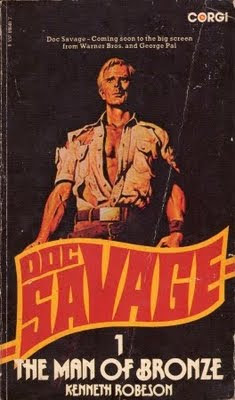 Doc Savage is actually Clark Savage Jr. His father had been a wealthy man who spent most of his fortune on adventures that combined intellectual curiosity, a taste for adventure and a desire to make the world a slightly better place in which to live. He died suddenly from an unexplained illness. He left behind him a secret message and a worldly legacy. This inheritance comprises a vast tract of jungle in the Central American nation of Hidalgo. Doc already has his doubts about his father’s death, and these doubts are strengthened by an attempt on his own life by a mysterious assassin who speaks the ancient language of the Mayans. When Doc and his friends set off to claim Doc’s inheritance they encounter continual attempts to prevent their arrival in the remote Valley of the Vanished. They also discover a lost civilisation and a fabulous treasure. Doc and his friends must battle a fiendish conspiracy to steal the treasure and at the same time save the ancient kingdom of the Mayans which still survives in a remote valley. Doc faces an even more frightening prospect - the daughter of the king falls in love with him but Doc has vowed to have nothing to do with women and seems more than a little afraid of them. The style is ultra-pulpy, which is no bad thing. It’s also energetic and highly entertaining. David Dodge’s best-known book is To Catch a Thief, on which Hitchcock’s movie was based. 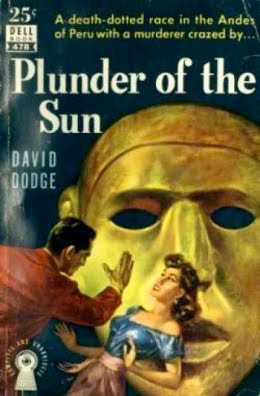 Plunder of the Sun is a similar kind of story - a combination of crime, adventure and romance. Al Colby is offered what sounds like an easy job. All he has to do is take a package from Chile to Peru. His employer is a dealer in art and antiquities so the package probably contains some kind of ancient artifact. Smuggling such an item is illegal, but not overly dangerous. Or so he imagines. The art dealer insists on accompanying him, but Colby will have to carry the merchandise. Since the dealer has a bad heart they must go by steamer. Colby soon makes the unpleasant discovery that someone on board wants that package. Wants it enough to kill. That apparently innocent package draws Colby into a chase for Inca gold. Lots of Inca gold. Treasure on a scale to stagger the imagination. And there are at least three parties after that gold. Colby is the first-person narrator but we find out very little about his background. Since he’s happy to be involved in smuggling we assume his past is a little shady but he’s no thug. Nor is he a loser. He has flexible morals, but he does have morals. And he’s no fool. We assume he’s probably been a private detective but he’s not fanatical about staying on the right side of the law. He’s tough and resourceful however, and he has moments when he feels a sudden overwhelming urge to do something honourable. This is not quite a hardboiled novel although it has affinities with that genre. There are certainly plenty of double-crosses and there’s a pleasing mix of action, romance and adventure. There’s also a femme fatale, or rather two femmes fatale. Dodge’s prose style is relaxed and easy. This is a thoroughly enjoyable tale, and was brought back into print by Hard Case Crime in 2005. It’s not quite the sort of book you expect from that imprint but it’s still worth checking out. Eric Ambler is perhaps the most unjustly forgotten of all 20th century British writers. Not 20th century British crime writers, but 20th century British writers in general. And Journey into Fear, published in 1940, is one of his finest books. Ambler’s spy thrillers are very much like Graham Greene’s. They’re dark and cynical, they’re seedy and grungy. This is a world painted entirely in shades of grey. You can trust nobody. The most innocent action can plunge you into a nightmare world of paranoia and violence. People want to kill you even though you’re not the sort of person that things like that happen to. And often you’re not entirely sure why they want to kill you. Take Mr Graham, the protagonist of Journey into Fear. I was almost going to say hero, but Amber’s world is like Greene’s. There are no heroes. There are plenty of victims, an abundance of innocent and not-so-innocent bystanders, lots of grey little men doing nasty little jobs, quite a few women prepared to do whatever they need to do in order to survive, but if you’re looking for conventional heroes you’re looking for the wrong author. Mr Graham is an engineer. He’s 40 years old, he has a very good job, he lives in a comfortable house and he has a wife with whom he’s quite contentedly in love. His latest job has taken him to Istanbul. Mr Graham works for an armaments manufacturer, but to him the latest naval guns (such as the ones he’s selling to Turkey) are merely an interesting engineering challenge. It has never occurred to Mr Graham to think of the products of his company as instruments of death. In the comfortable and respectable suburb in which he lives people don’t talk about such unpleasant subjects. So it comes as a huge surprise to Mr Graham when someone tries to shoot him in his hotel in Istanbul. In fact it’s such a surprise that he refuses to acknowledge it. He assumes it must have been a hotel thief. Mr Graham’s secure assumptions about the way the world works, or at least the way his world works, are rudely shattered in an interview with Colonel Haki of the Turkish Secret Police. Colonel Haki assures him that if he catches the train to Paris as he intends his chances of reaching England alive are somewhat less than zero. Mr Graham finds himself on a disreputable steamer bound for Brindisi in Italy. It’s not a desirable means of travel but Colonel Haki has advised him that it’s the safest method. Mr Graham believes his troubles are over, until he spots among the passengers the very assassin who tried to kill him in Istanbul. Ambler resembles Greene also in the fact that there is more more going on here than just a spy thriller. The emphasis is on psychology and atmosphere rather than action, and there’s also the sense of a civilisation collapsing into anarchy and chaos. 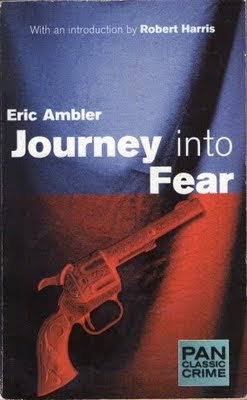 Ambler’s reputation rests mainly on his three classic late 1930s novels, Epitaph for a Spy, Journey into Fear and The Mask of Demetrios. They’re among the greatest of all spy thrillers. Sâr Dubnotal vs Jack the Ripper collects five of the twenty Sâr Dubnotal stories published in French pulp magazines in 1909. The stories were published anonymously and the identity of the author has never been definitively established. Sâr Dubnotal was one of the first fictional superheroes. The stories combine gothic, supernatural, adventure and crime elements in a trashy but entertaining blend. Sâr Dubnotal, also known as the Great Psychagogue, is a master of the art of psychognosis. He has studied occult philosophies under a noted eastern yogi and has developed his psychic abilities to a supremely high level. His powers have earned him a vast fortune and he now devotes his life to investigating crimes involving the occult and generally battling evil. He has a team of assistants and disciples and he can call on aid from a powerful yogi who has had himself buried alive but who can leave his earthly body at will. The five stories in this volume form a connected series. A remote Breton house has been the scene of what appears to be a haunting. It’s a haunting of fairly recent origin, and the most obvious culprits are the old Comte de Trégully or his son Jean. Both died in slightly questionable circumstances. 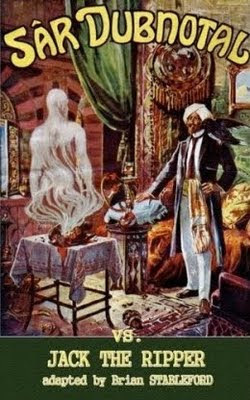 If murder was involved it would explain why the deceased spirit’s is haunting the house. But what of the current owner of the house, Jean’s widow, the Comtesse Azilis de Trégully? Sâr Dubnotal soon becomes convinced that the evil hypnotist Tserpchikof is the prime mover in evil events that occurred in the past, and in further evil events that are even now being planned. The overheated plot will eventually embrace a vast criminal conspiracy known as the Chessmen, the mystery of the Flying Dutchman, and Jack the Ripper! This is another publication from Black Coat Press translated by Brian Stableford. He provides his usual fascinating introduction. The Sâr Dubnotal tales are not exactly great literature and are in fact chaotic and occasionally completely incoherent in construction. They’re not exactly models of literary style either. As Stableford explains, however, they are a significant step in the development of popular fiction. They’re a very early example of the superhero genre, and they’re an interesting blend of crime and gothic fiction, of detective story an supernatural thriller. And despite their flaws they’re fairly entertaining. Worth a look for anyone with an interest in early pulp fiction. The Best Thinking Machine Detective Stories collects a dozen stories featuring Jacques Futrelle’s fictional detective, Professor Augustus S. F. X. van Dusen. As his nickname The Thinking Machine implies, van Dusen is very much in the “detective as intellectual genius” mould. The Thinking Machine leaves most of the legwork to his friend Hutchinson Hatch, a newspaper reporter. His boast is that he applies rigorous logic to the solving of crimes. This method, along with his background as a scientist, makes him a formidable enemy of the criminal classes in early 20th century America (Futrelle, despite his name, was an American). Futrelle’s plots are ingenious, and although they occasionally strain credibility Futrelle did make a real effort to make the solutions to his crimes relatively plausible. The collection includes The Problem of Cell 13 – one of the most famous of all detective stories, and a story that holds up remarkably well. The Scarlet Thread, The Brown Coat and The Flaming Phantom are good examples of Futrelle’s art – crimes that appear to be impossible (a word that always exasperates nickname The Thinking Machine) but turn out to have rational and believable, if highly convoluted, explanations. The Phantom Motor doesn’t work quite so well – the solution is just a little too contrived. The Problem of the Stolen Rubens and The Missing Necklace illustrate van Dusen’s method exceptionally well. The Thinking Machine solves the case by finding the only possible method whereby the thefts could have been carried out. The Lost Radium is amusing, and shows Futrelle’s fascination with science. The plot is gimmicky but entertaining. Professor van Dusen and Hutchinson Hatch don’t have the depth of characterisation or the complexity of Holmes and Dr Watson but van Dusen is an amusing and entertaining hero. The stories were mostly written around 1905-06. Sadly, Futrelle was drowned when the Titanic went down in 1912. His stories are immensely entertaining and really deserve to be more widely read. In terms of commercial success Mickey Spillane was certainly one of the big guns of hardboiled and/or noir fiction. His books have sold around 225 million copies which is not to be sneezed at. But while other hardboiled writers like Hammett, Chandler, Cain, Jim Thompson and Horace McCoy have gained at least a small degree of acceptance by the literary establishment Spillane is still generally reviled. It’s not difficult to understand why, although it’s arguably something of an injustice. The political subtext of Spillane’s books is not such as to endear him to the denizens of academia (as compared to Hammett and Chandler for instance). Spillane cannot be made politically correct. And Spillane stubbornly refuses to be cynical about the sorts of things writers are expected to be cynical about. Things like law and order. In fact his greatest crime is probably his overall lack of cynicism about American society. There’s the same passionate outrage against corruption that you find in Chandler, and Spillane certainly can’t be accused of being naïve about the seamy underside of the American Dream. But Spillane still believes that justice can prevail. And of course there’s the question of violence. Mike Hammer might be a righteous avenger but the relish with which he exacts revenge is going to make some people uncomfortable. Which brings us to My Gun is Quick, which came out in 1950. This was the second of the Mike Hammer novels. Surprisingly enough Spillane only published thirteen Mike Hammer books. Hammer runs into a red-headed prostitute in a bar. He’s not interested in her professional services, he just buys her a cup of coffee and chats to her for a while. He’s tired and drained and just wants someone to talk to for a while and she’s a willing listener. In a fit of generosity that he can’t even really explain to himself (except that he’s just been paid a huge amount for a very easy job and temporarily has more money than he knows what to do with) he offers her enough money to buy some decent clothes and get a regular job. He wouldn’t give this very minor incident a second thought except that the red-headed streetwalker turns up dead the next day. It’s none of Hammer’s business really but he just can’t stand the thought that for once he does something nice for someone and straight away they wind up dead. All the injustice of the world is suddenly crystallised in this one senseless death. And then Hammer starts to realise that the death, ascribed to a hit-run driver, doesn’t add up. It starts to look like murder. Needless to say it doesn’t stop there. The trail leads Hammer into a world of vice and corruption and violence. My Gun is Quick differs from most earlier hardboiled detective stories in that Mike Hammer’s quest for vengeance is very personal. He’s not just pursuing this case for the money and in fact he’d follow it up even if he wasn’t getting paid. It’s the kind of obsessive revenge story one associates more with the blood-soaked world of Jacobean tragedy or with classic western movies. While Mike Hammer has no time for pimps or for dishonest city officials who turn a blind eye to vice rackets he’s surprisingly sympathetic and non-judgmental towards prostitutes. That’s something one doesn’t quite expect, given Spillane’s reputation. Spillane’s style might lack the polish of Chandler’s but like Mike Hammer’s detective methods it gets the job done. It’s an exciting well-paced crime thriller even if the major plot twist isn’t difficult to guess. There’s enough energy in the writing to overcome some deficiencies in plotting. Hammer is an old-fashioned non-PC hero and you’re either going to accept that or you’re not. If you can’t accept it you won’t like Spillane. If you can accept it there’s plenty to enjoy. It’s rough around the edges but it doesn’t pull its punches and it’s highly entertaining. I’m off to read more Mickey Spillane.